A great many of us deal with crooked teeth. In most cases, the cause is simply genetics. Regardless of the reason, many people want to address the issue but do not want to deal with conventional braces. In the past, the only way to straighten crooked teeth was with metal braces. Fortunately, times have changed, and new technologies have been created which allow teeth to be straightened in a far more discreet manner. Here at Dental Innovations, we use the ClearCorrect brand of braces. What Does the ClearCorrect Process Entail? If you’re considering trying ClearCorrect braces, you might like to know more about the process. In general, the process is separated into three parts, all of which will be discussed below. If you decide that you’d like to use ClearCorrect, you will first have to schedule an appointment with our dentist. At this appointment, the dentist will inspect your teeth, ensuring that they can realistically be straightened with the use of ClearCorrect braces. Dr. Thomas Murray is the lead dentist at Dental Innovations in Chicago. Dr. Murray will discuss the teeth straightening process with you, making sure that you’re comfortable enough to continue. If you and Dr. Murray decide that ClearCorrect braces are right for you, you will begin the process. The first part of the ClearCorrect process is the manufacture of the aligner. In order for ClearCorrect to manufacture an aligner which will straighten your teeth properly, we need to measure your teeth in a number of ways. Dr. Murray and his staff will assess and examine your teeth, creating a wide variety of dental impressions, photos, and x-rays. We will then use these measurements to create a prescription for your aligner, sending the prescription to the ClearCorrect facilities so that their specialists can devise a long-term alignment plan for you. 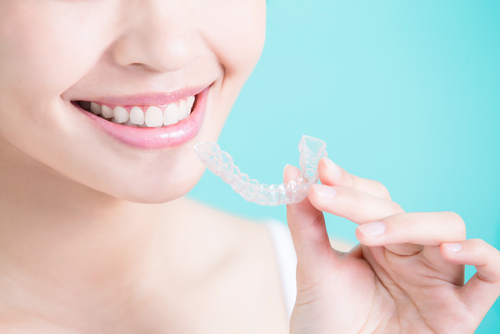 After you’ve discussed and approved your alignment plan, ClearCorrect will send you your first pair of aligners. These aligners will need to be worn all day, every day, except for when you eat. You won’t be wearing the same aligners for the duration of the teeth straightening process. In order for ClearCorrect to accommodate changes in the configuration of your teeth, additional aligners will need to be worn. Realistically, you can expect to wear as many as 30 sets of aligners in the single year that you’ll be using ClearCorrect. You can obtain new aligners by scheduling follow-up appointments with our team. Dr. Murray will continuously monitor the movement of your teeth, working with the ClearCorrect team so you receive the aligners you need when you need them. While ClearCorrect is a terrific option for many individuals who are looking to straighten their teeth, it is not a suitable option for all individuals. Some patients’ teeth are positioned in a manner which prevents ClearCorrect braces from working effectively. While these patients might see some results from ClearCorrect, there’s a chance that they won’t be happy with the overall results. In some cases, traditional braces must be used. To find out whether or not you can truly benefit from ClearCorrect braces, you will need to schedule an appointment with our team. Dr. Murray will examine your teeth, and determine whether or not ClearCorrect can be of genuine value to you. Schedule Your ClearCorrect Appointment Today! Interested in hearing more about ClearCorrect braces? Looking to start the process? You can begin by scheduling an appointment with the dental professionals here at Dental Innovations. We will provide consultation and examine your teeth to determine whether or not you are a viable candidate. Contact us right now to get an appointment scheduled!